Urban agriculture refers to any gardening or growing practice conducted within or around a city or suburban area. According to the USDA (2013), this can include any method of backyard, rooftop or balcony gardening; gardening in vacant lots or parks, known as community gardening; and the grazing of livestock in any open space. According to the Food and Agriculture Organization of the United Nations (2012), the world’s population is predominantly urban. By addressing ways to grow food in urban areas, rather than depending solely on rural farms or transported food, we could sustainably feed our population. Creating community gardens along with other urban agricultural techniques also has the added benefit of being aesthetically pleasing. This is particularly so with community gardens which utilize unused, public, or dilapidated lands in urban locations (Abiola, 2000). Urban agriculture can be used as an entrepreneurial activity, creating an income for someone who might not have a job elsewhere or by creating new jobs for individuals (Bailkey & Nasr, 1999). Urban agriculture also strengthens community support, awareness, and connections. The access of fresh food and, possibly more nutritious food, increases with urban agriculture and benefits community health (Bailkey & Nasr, 2000). Rooftop gardens can create a cooling effect on the living area below, resulting in lowered air conditioning costs and fewer greenhouse gas emissions (Liu, 2002). Urban agriculture can attract pests, which could lead to unsanitary conditions, the spread of disease, and the increase in certain pollutants (Abiola, 2000). Gardening in cities and around cities is a local subject, as it should be. A difficulty might arise in finding the balance of staying local versus expanding and selling to those outside the city (Morgan, 2009). Urban environments can be more prone to having “soils containing toxic levels of heavy metals including lead, cadmium, mercury, nickel, and copper” which can negatively impact human health (Bellows, Brown & Smit, 2004). There are many factors to consider when analyzing “sustainability.” Urban agriculture is sustainable in different ways than fair-trade produce; both should be treated equally, because their methods deal with different ideas of sustainability (Morgan, 2009). 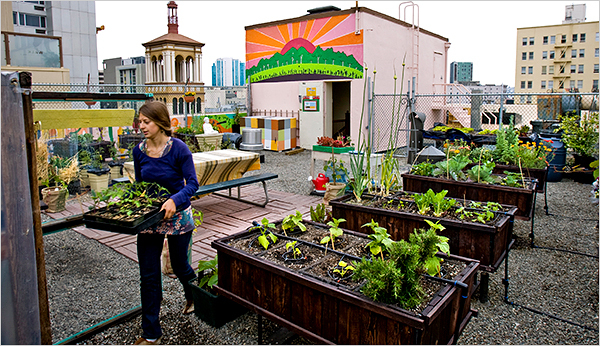 Take a look at these resources and decide for yourself what you think about urban agriculture! Want to see some real life examples? Check out these sites! This entry was posted in Uncategorized and tagged local food, urban agriculture, urban farm, urban gardening by Eric Bendfeldt. Bookmark the permalink.